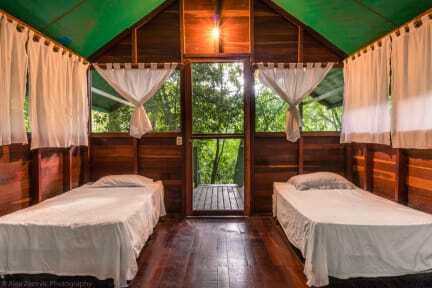 Chaltunha Hostel San Miguel Flores i Flores, Guatemala : Boka nu! Security for the rooms was not good. Was far away in the back and there were only one key to the rooms of 4 so the rooms were left unlocked to not have to go to the reception to get the key. No extra lockers. No extra lamps by the bed. Neighbours were very loud with musik the first night but quiet the second. Roosters loud both nights. Owners are nice and friendly and willing to help organize activities. Very nice view but a little inconvenient if you want to be in Flores most of the time.